On October 20, 2011 the Metro Council approved a 1,985-acre Urban Growth Boundary (UGB) expansion for the Portland metropolitan region. The expansion is split into four areas, all of them in Washington County, including roughly 1,650 acres for new residential developments and 330 acres intended to attract industrial employers that use large lots. A map of the expansion, provided by Metro, is available here. 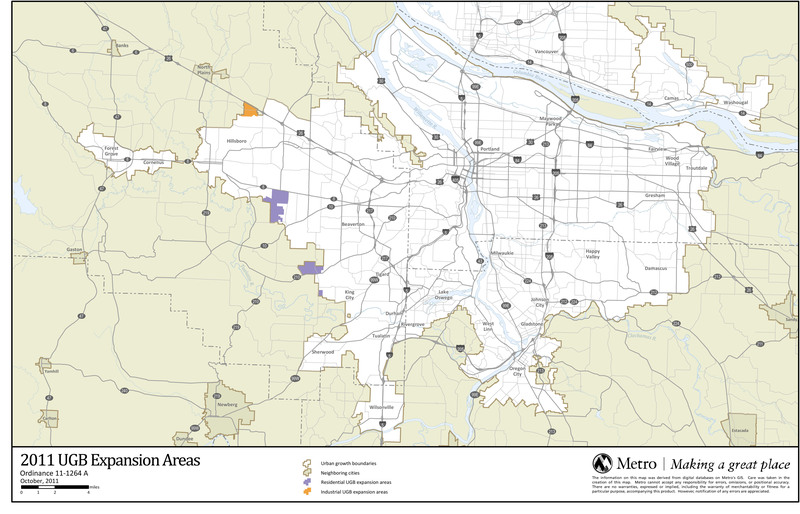 Metro Council plans to vote October 20 on a proposed urban growth boundary (UGB) expansion for the Portland metropolitan region. They need to hear now from area residents and businesses who believe that a strong UGB supports sustainable economic growth, needed infrastructure investments, and the vibrant neighborhoods we all value. On July 5th, 2011 Metro released its recommendation of options for where the Portland region should expand its Urban Growth Boundary (UGB) to accommodate projected residential and industrial uses over the next 20 years. Metro is considering expansion areas that total approximately 3800 acres to the UGB, primarily in Washington County. One of our Summer Interns, Nathaniel Berger, recently paid a visit to Zenger Farm, in Southeast Portland, where he participated in a volunteer project and learned about urban agriculture. Nathaniel hails from Atlanta, Georgia and is a rising Junior at Duke University.